AIA Pennsylvania is taking our well-received codes training seminar on the road to Pittsburgh! Join us in partnership with AIA Pittsburgh for a two-day seminar breaking down the updates you need to know to get up to speed on Pennsylvania’s newly adopted codes. 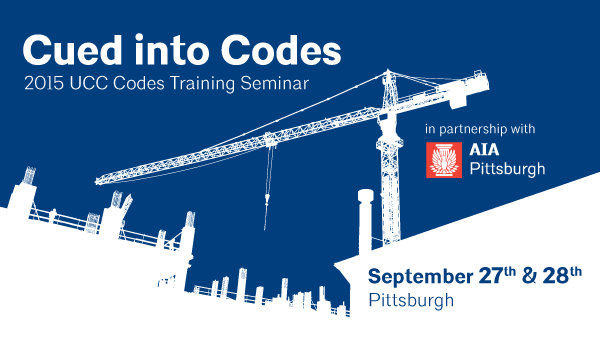 Code experts including members of the Pennsylvania Department of Labor and Industry’s UCC Review and Advisory Council (RAC) will equip you with first hand knowledge and the confidence to be code compliant ahead of the October 1st deadline. Save on your registration fee and get crucial MEP code updates when you register for both the commercial and residential training days! Registration fees include breakfast, lunch, and spiral-bound program slide decks. Earn up to 16 AIA LU | HSW credits. An in-depth discussion of the changes to the UCC from 2009-2012-2015 and what the AEC community needs to know about RESIDENTIAL codes. Earn up to 9 AIA LU | HSW credits. An in-depth discussion on the changes to the UCC from 2009-2012-2015 and what the AEC community needs to know about COMMERCIAL codes. Earn up to 7 AIA LU | HSW credits.